We’d love your help. Let us know what’s wrong with this preview of Philosophy in the Flesh by George Lakoff. To ask other readers questions about Philosophy in the Flesh, please sign up. The hardest thing to see is the lens through which we see all things. Becoming aware of that lens, of what the “real foundations of [our] inquiry” are, is the aim of this work. It is nothing short of an attempt to explicitly articulate the taken-for-granted conceptual “basics” on which we unconsciously (and uncritically) rest any time we frame a perspective of the world, and of ourselves. Making explicit the structure of the conceptual filtration system by which we give shape to our worlds of experience is the general aim of cognitive science, but it has also been the topic of much philosophical theorizing. This book is an important attempt to compare the notes gathered by these two quite distinct modes of theorizing, and to explore a way to create a fruitful cross-pollination between them in order to construct a mode of theorizing that joins their strengths while winnowing out their weaknesses through sustained mutual criticism. Above all though, the fruit of the labour of understanding is the increased self-knowledge of the reader. This work belongs (along with other giants such as Deacon's “Incomplete Nature” and Thompson's “Mind in Nature”) to that uniquely modern genre devoted to paradigm re-evaluation. Such works attempt to take a reflexive leap above any existing paradigm in order to explore what is involved in the phenomenon of paradigm formation itself. I like to call this genre “perspective-taking,” as it seeks to forge a conceptual lens whereby we can come to reflect on the nature of all our other lens, on which we rely in more specialized inquiry. Forging what could be called a critical “meta-lens” is its subject and goal. This is metacognition at the level of cultural consciousness, and is as such an interesting development of the larger project of late modernity. Although we see all things through a network of blood vessels superimposed on our retinas, we tend to fancy ourselves to be transparencies, enjoying a direct, unmediated and unproblematic connection with our worlds. L&J show us here, in painstaking detail, how the unity, structure and consistency of our phenomenal world are a construction effected by our unconscious conceptual apparatus. They bring home the way each structure we perceive in any situation is an abstraction – that is to say, a pragmatic simplification. This abstraction is invariably a function of the structure of the cognitive filtration system at play. Every filter gives us back a form that mirrors the structure of the filter. Every grasp we can gain on reality, whether in experience or knowledge, thus bears the imprint of our form, and indirectly gives us back, together with the positive content of the vision, also an implied reminder of our limits – that we cannot see and know things otherwise. An uncritical faith in the givenness of the structures we encounter is understandable in the bustle of day-to-day life, but it becomes a liability for any species of theorist. L&J make the radical claim that unawareness of this fallacy is the most determining factor in the history of philosophy. They write an entire intellectual history showing how various thinkers' conceptual apparatus is their unknown destiny. They show how it leads them to posit ontologies that project and confirm its structure, thus determining their systems' developmental trajectory from the start. In the hands of L&J, we can appreciate that the most critical player giving structure to intellectual history – the cognitive unconscious and its range of possibilities - has yet to be described. It is what is actually at work generating the structure of the explicit systems and constraining the range of their possible permutations. Central to L&J's undertaking is their “cognitive science of philosophical ideas,” which seeks to lay bare the taken-for-granted conceptual toolkit philosophers implicitly rely on and place it under the scrutiny of cognitive semantics. This undertaking seems to me to revitalize philosophic inquiry by giving philosophers yet another instrument for self-scrutiny. L&J endeavour to “reopen basic philosophical issues,” oftentimes brilliantly showing how underlying the set of problems that form the explicit traditional subject matter of philosophy (eg: the various paradoxes derived from our conflicting concepts of cause, time, space or self) are far more fundamental problems that concern the delimiting of the problem field itself by the cognitive unconscious. They show that the real problems of philosophy are often BENEATH the problems we usually focus on, and that they are often inadequately formulated and explored for lack of an adequate instrument. Cognitive science, they argue, is just the tool we were missing, allowing us a “detailed description” of this elusive terrain. The critical project that philosophers like Kant initiated can thus be empirically consummated. Arguably the most basic, the most foundational element of ANY paradigm is the model of reason it operates with; the process of selective, abstractive simplification starts here, with this fundamental choice (essentially normative in character, especially when not empirically backed) of a privileged way to conceive of reason. This choice enables certain modes of relating to reality, while blocking out others, and it is precisely at this level that L&J thinks more theoretical focus should be dedicated. The arguments clearly owe much to the theoretical possibilities opened up by Kant's critical turn, and essentially boil down to this: what conceptual structures we're unaware of, we'll project onto the world, and compulsively reify into entrenched worldviews and institutions. They see this dynamic at work in Western intellectual history: the privileged model of “disembodied” reason, taken uncritically, led thinkers who adopted it to project a worldview that reified human conceptual forms (ie, the “laws” of nature, the structures, the forms, the essences, the principles, the foundations) as ultimate ontological existents in a view they call “disembodied” realism which they take to be the baseline stance of the tradition. To support the ontology, an epistemological theory was created and maintained at all costs through countless revisions, the correspondence theory of truth. The correspondence theory turns out to be a neurally unrealizable fiction of epistemic wishful thinking. The irony that shines forth in this book is that classical realism was normative, while purporting to be descriptive. It was constructed in order to dodge the epistemic problems that would emerge from considering the perspectivity of truth. Their central argument in the book is that this whole superstructure collapses once you look, empirically, at the way reason -actually- works. It turns out that reason is embodied, contra the traditional view, and that the concepts it operates with do not fit the normative requirements of the traditional model, which dictated that concepts must be literal, monolithic, univocal, propositional, and capable of conforming to necessary and sufficient conditions. It is instead structured according to unconscious metaphorical mappings. So what is embodied reason? It is organismic, evolutionary, ecologically embedded, socio-culturally situated, historically constituted, largely unconscious, imaginative, metaphorical, perspectival, informed by emotion, intersubjective and relational through and through. Traditional dichotomies, such as imagination/reason, emotion/reason, or action/reason, are dissolved. Reason is not autonomous, but constitutes itself in positioning itself within an environment, both cultural and ecological. In giving shape to our thinking, the most decisive factor, next to our model of reason, is our way of constructing categories. This is the fundamental pretheoretical act that prespecifies the domain of any explicit theory. So how do the categories of embodied reason differ from those of reason as traditionally conceived? It turns out most human concepts carry no propositional structure and are not fully mappable according to necessary and sufficient conditions, because the “structure of concepts includes prototypes, and each prototype involves a different mode of reasoning.” And most significantly, perhaps, each skeletal concept is almost never monolithic or fully literal as it is given full sense through being fleshed out by multiple incommensurable metaphors. They argue that our most elementary, visceral, intimate knowledge of the world is encoded in “primary metaphors” - linkages between distinct neural domains formed in our early sensorimotor engagement with our environment. Interestingly, these primary metaphors are universals that are learned, and they form the ground of our intersubjectively shared world, as well as connecting us to stable structures in the environment that are pertinent to our functioning. These metaphors are the foundation of all our later knowing of the world and supply the materials for all reason, regardless of its level of abstraction or sophistication. They show how so much of our most abstract reasoning imports inferential patterns from these early sensorimotor linkages. As an example of their analysis, they show how the birth of formal logic was based on the metaphor of categories as containers which is derived from our sensorimotor experience of space. Thus, we speak of members of a given category as being “inside” a metaphorically projected container. From this emerges the notion of predication, or “inclusion” “in” a category. So at the center of Aristotle's (and much of our) logic is the metaphor “Predication is containment,” by which we use the image schema of containment to pattern our linkage of statements. Logic uses our bodily experience of space and projects its pattern onto domains far beyond the source of the original experience. And what about math, which would seem as “pure” as it could be of all bodily interference? As far as I can gather from their work, math and logic are not exempt from the general rule; the are also instruments that are heavily determined by cognitive unconscious metaphorical patterns of inference drawn from sensorimotor experience. This seems to suggest that our capacity for reason far exceeds the purview of these formalized systems, that the true principles by which we reason far transcend those currently statable by formal logic. Logic can thus not be the ultimate grounding for truth-claims, as it is not a ground of itself. Since these principles are as yet largely unknown to us, we are mostly driven by them unconsciously. Cognitive semantics thus becomes an invaluable tool for the uncovery of our full capacity for rational insight. However, just what, precisely, a logic grounded on metaphorical concepts would be like is unclear, as is how, specifically, it relates to logic as we know it. Also unclear is what precisely “metaphorical truth” consists of. Because reason is embodied not only in the relative constancy of a natural environment, but also in ever-shifting cultural environments, it is subject to historical development, and to a certain degree of relativity. They take pains to reject the universality traditional philosophy posited as its characteristic - insisting there is neither “rational structure” nor any ready-made categories to be found in nature - insisting instead on its perspectivity. Indeed, they treat this presumed structural “universality” as a reification, a projection of our cognitive categories onto the world. Still, while there are no perspectival universals such as a priori philosophy a la Kant has dreamt of to ground our reasoning with, Lakoff and Johnson hold that there are nonetheless commonplaces we can put our foot on, and that these emerge from the common structure of our embodiment, and from the regularities of our interaction with the larger natural milieu within which the manifold of culture was constrained to evolve. They seem to hold up these cognitive fundamentals collectively as a new criterion, a stable point of reference, according to which systems can be evaluated and compared so as to escape the relativistic flux. What are the ontological implications of all of this? All that remains in the wake of L&J's conceptual demolition work is a cognitive, “embodied realism,” rooted in our sensorimotor connection to our environment as encoded in our basic level categories. This immediate connection occurs only at this level. The authors note that “evolution has not required us to be as accurate above and below the basic level (of categorization) as at the basic level, and so we are not.” Thus, the more general concepts which supply the arsenal of all our theorizing and science are only indirectly grounded, via the basic level. They argue that science and technology “extend the basic level,” but the question remains as to how, if they are right, we can legitimately extrapolate from our experience, generalizing its pattern far beyond the ecological niche to which our cognitive apparatus has been fitted, as we do in science? They insist, contra the disembodied realists (of whom the Analytic philosophers are the latest mutation) that “[w]hat has always made science possible is our embodiment, not our transcendence of it, and our imagination, not our avoidance of it.” And yet I am not entirely sure that the authors' arguments have successfully established that this form of realism is anything more than pragmatism. And if it's no more than pragmatism, how are the foundations of math, logic, and science secured here? Clearly our mathematical models do have a great deal of predictive power. This seems to necessitate a fit beyond the basic level which, according to their theory, is not guaranteed. This epistemic can of worms is yet to be resolved as far as I can see. The critical lucidity of L&J manages to effect a final expurgation of anthropomorphism (preserved in reified metaphors such as the “laws” of nature, the “fundamental mathematical structure” of the universe, the “computer programs” in the brain, the “machines” in the body, the “information” in the quantum realm or “in” DNA, and so on) that has been the whole goal of science since at least Occam. In contrast, the reigning metaphorical mechanomorphism and computationalism of standard materialism seem like anthropomorphism in drag. Time and again they show that it is not only philosophers who are afflicted by the anthropomorphism bug, but also scientists. “Conceptual blends are the norm in science,” they note ruefully. Their example of computational neuroscience exposes a pattern they believe to be universal in science: reductionisms of various sorts turn out to be nothing more than reifications and projections of conceptual fashion or of the theorist's preferred metaphors. Their cognitive critique forges an invaluable epistemic instrument which, I'd agree, should become a functioning part of ANY theorist's toolkit. The self-reflexivity it brings is ultimately liberating. Perhaps the source of their critical rigour is precisely this willingness to refrain from projecting ontologies merely to ease epistemological aches. As a joke, it'd be fun to see them write a sequel doing a history of metaphorical thinking grounding scientific practice. I suspect it will not be very popular. What's missing is an application of this method to the description of other philosophical traditions. It'd be interesting to see how each differentially taps into the resources of the cognitive unconscious. Also missing is an understanding of how their work is an offshoot of a much larger philosophical project, initiated by Kant's critical turn. Seen as a complementary project to the transcendental phenomenological critique which seeks to map what Chalmers' called the 1st person point of view, L&J indeed offer a good mapping of how to proceed along the 3rd person, empirical point of view of reason. The real question of the future is, perhaps, which larger map contains the two. Neither side alone suffices. In the late 1980s, I read Women, Fire, and Dangerous Things by Berkeley cognitive linguist George Lakoff, and he almost made me forget my Noam Chomsky psycholinguistics obsession, with the book's intriguing study of categorization and language. Throughout the 1990s, I studied neural networks in vertical perception domains such as vision processing. So how did I manage to miss the fact that Lakoff and his University of Oregon cohort Mark Johnson published a massive work in 1999 that made the case In the late 1980s, I read Women, Fire, and Dangerous Things by Berkeley cognitive linguist George Lakoff, and he almost made me forget my Noam Chomsky psycholinguistics obsession, with the book's intriguing study of categorization and language. Throughout the 1990s, I studied neural networks in vertical perception domains such as vision processing. 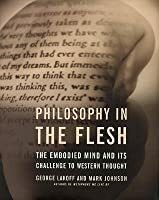 So how did I manage to miss the fact that Lakoff and his University of Oregon cohort Mark Johnson published a massive work in 1999 that made the case for tying philosophy closely to what is known about neural processing and the human body? In the 19 years since this book was published, the advances in understanding convolutional neural-network architectures, and in implementing those architectures in deep learning platforms from companies such as Google and Microsoft, have only reinforced the arguments Lakoff and Johnson make in this book. In essence, the authors suggest we need to toss out many conclusions of Plato, Descartes, Kant, and even Russell and Quine, because there are no external forms, there is no abstract mathematics or formal logic dwelling in the universe outside of an embedded pattern-matching human mind - in short, there is no magical disembodied intelligence outside the body, at least not anything capable of being grasped by the limited human brain. Just as important, it is wrong to conclude, as Descartes did, that the conscious mind can fully ponder and understand itself, because cognitive neuroscience teaches us that 90% of all brain processing is embedded and not available to the conscious mind. We're not talking here merely about the subconscious, however you wish to define that. We are talking about the bulk of tasks taken up in moving, perceiving the body's position in space, seeing, talking, hearing - our conscious mind as we understand it only processes the high-end results of millions of sub-neural-networks pre-processing this information. Over the last few decades, some scientists and philosophers say they find Lakoff arrogant; maybe not on a personal basis, but certainly as a scientist. The empathy-and-mind researcher Steven Pinker is the most famous of these critics, rejecting many of the findings in Lakoff's 2006 book, Whose Freedom? I did not find Lakoff and Johnson arrogant in any way throughout this book, although the importance they attach to the "conceptual metaphor" as an atomic element for neural processing may be overstated. Mapping of multiple layers of metaphor seems to match the back-propagation and hidden layers of neural architectures well, but we needn't assume that "one size fits all" in how the brain builds a gestalt for consciousness. The reason Lakoff and Johnson may sound arrogant to some is that they clearly state what forms of philosophy are bound to be wrong, given what we know about cognitive neuroscience. And what was true in 1999 is much more true in 2018. This is nothing new, but it upsets centuries of thought in many fields. For example, in the 1970s, most artificial-intelligence researchers followed the Marvin Minsky school, which assumed that intelligence is built from the top down, using formal rules and imposed frameworks from above. Rules-based A.I. was largely a failure because most intelligence is not a top-down affair. Neural-network studies, launched in the 1940s and revived in the 1980s, went from success to success because the A.I. philosophers in these fields believed that intelligence is emergent, bubbling up from the lowest levels to the highest. This should have been evident from half a century of research into computer architectures and robotics. The reason it's so hard to build a robot is that we assumed that teaching a robot to walk and manipulate in space was the easy stuff. No. The easiest compute task, given enough logic gates, is to have a computer break codes or compute artillery tables. The hardest computing tasks involve having a robot maneuver itself through space, seeing, hearing, responding to the environment. We humans thought this would be easy because we do not understand the underlying complexity of most of our "conscious" thought and body processes. In fact, what we call consciousness is a very slippery thing. But once we admitted that bottom-up is many times more important than top-down, the whole edifice of Platonic philosophy began to crumble. The second series of disruptions came with Douglas Hofstadter's 1979 book, Godel, Escher, Bach: An Eternal Golden Braid, where he introduced the lay public to Kurt Godel, and the subversive idea that no system of logic or thought, mathematically described, could be complete because of self-recursive incompleteness theorems. An anecdote later emerged that Bertrand Russell, Whitehead, and Wittgenstein later rejected much of Godel's findings because they didn't understand what the hell he was talking about. It's a pity, because then they would not have wasted so much time building interlinking systems of formal logic and formal mathematics that ultimately meant little and signified nothing. This book is by no means harsh regarding humans, our place on the planet, our apparent free will, etc. They only insist that our definitions of "our bodies, ourselves" should be changed based on what is known about the human animal. In many ways, making sure that any formal philosophical method is compatible with low-level body processes, with poetry, with being-in-the-world, is something that leads to a more humane result than Quine, Russell, or the formal logic school (and much more humane than the existentialists or post-modernists). The concluding chapter may be the thorn that causes many philosophers to call Lakoff arrogant, because the authors insist that any future philosophy must be aware of, and intimately connected to, the findings of cognitive neuroscience. But this already has taken place for the followers of Freudian psychology! From the 1970s on, studies in behaviorial psychology, brain-cell biology, psychopharmacology, and cognitive neuroscience, undermined more and more of the Freudian basis for psychoanalysis, until there was little left of Freud's beliefs. It wasn't that any group of psychology researchers explicitly declared Freud dead. But as Thomas Kuhn said in The Structure of Scientific Revolutions, a new scientific theory almost never displaces an older one because individual people change their minds, but because the people believing in the older theories die out. There are still Freudian psychoanalysts out there, but they are seen as less and less relevant with every passing day. How to make philosophical tripe. 3) Add yeast and bake until it rises to over 500 pages. Maybe I'm being unfair-there are some interesting insights, but I'm irritated to the extent that they claim to contribute anything new to the discussion. Being a student of the Western Philosophical canon and positively fascinated by Psychology, this book - which puts a spotlight on the canon consisting of what we've learned through the study of the human mind - is fascinating, illuminating and - in my opinion - required reading. The questions that make Philosophy so necessary and so fascinating are deeply and significantly impacted by facts about how our brains function. Philosophy in the Flesh is the cooperative effort of a cognitive psychologist and a philosopher. It begins by introducing modern cognitive psychology, and explaining how it is much more experiment-based than the previous generation of psychological explanation. This is followed by an overview, with examples, of many of the metaphors that dominate our lives: viewing time as a stream, viewing goals as places to go to, and so on. The second half of the book, roughly, discusses various Western philosophical positions in light of the metaphors that ground those positions. This is where the book gets much more speculative as far as I can tell, because the only sources for what metaphors were in Aristotle's head are his writings, we can't experiment on him! Within this second half of the book, there is a discussion on religion and the metaphors underlying various forms of Christianity specifically. This is a very trendy topic these days and could be the subject of an entire book to itself. The main metaphor raised is whether God and society are modeled as a strict father vs. a nurturant parent. It's clear which model the authors prefer, for religion as well as for public morality outside of religion. This kind of information, model and analysis is definitely a good tool for thinking about how people think. I'm sure I'll be obsessed with this for quite a while as I practice applying metaphorical analysis to language and ideas. It's funny that, given the authors' explication of metaphors in all the world's philosophies, they should blatantly ignore the metaphorical assumptions which they make themselves. Specifically, they denounce all the metaphysicians for assuming that "there is a category of all things that exist", while they make much the same assumption when they defend the aims of neuroscience against the critiques of post-structuralism - that there is only a single container (the findings of science) which enca It's funny that, given the authors' explication of metaphors in all the world's philosophies, they should blatantly ignore the metaphorical assumptions which they make themselves. Specifically, they denounce all the metaphysicians for assuming that "there is a category of all things that exist", while they make much the same assumption when they defend the aims of neuroscience against the critiques of post-structuralism - that there is only a single container (the findings of science) which encapsulates all convergent results. 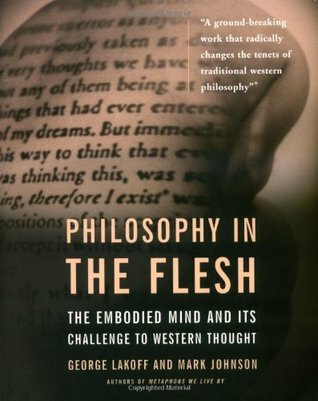 This book is welcomed counterweight to much of Western philosophy and the idea of a split between mind and body. "Reason is not disembodied, as the tradition has largely held, but arises from the nature of our brains, bodies, and bodily experience," the authors write early in the book. The book points out that our explanations of the world, particularly philosophy but even science, are mostly metaphorical. My biggest problem with the book is not a dearth of good ideas but its numbingly dull pro This book is welcomed counterweight to much of Western philosophy and the idea of a split between mind and body. "Reason is not disembodied, as the tradition has largely held, but arises from the nature of our brains, bodies, and bodily experience," the authors write early in the book. The book points out that our explanations of the world, particularly philosophy but even science, are mostly metaphorical. My biggest problem with the book is not a dearth of good ideas but its numbingly dull prose. It reads like a textbook, which it well may be. Turning abstract ideas into interesting prose is difficult, but this book largely fails on this point. The authors' "Metaphors We Live By" is a far better written book, in my view. Two areas of particular interest to me were color and time. The book reminds us that color is not innate in the physical world. "Colors are not objective; there is in the grass or the sky no greenness or blueness independent of retinas, color cones, neural circuitry, and brains. ... Rather, color is a function of the world and our biology interacting." Taking the matter further, we realize that we live in a "mediated" world of our senses. Sound, warmth or cold, texture, taste, and smell and even shape and dimension are not innate in the physical world. Johnson and Lakoff have interesting statements about the elusive concept of time: "We cannot observe time itself -- if time even exists as a thing-in-itself." They amply demonstrate that it is impossible to talk or write about time without resorting to metaphor. It took me a while to finish this book. It was worth every minute though. The central tenet of this book is that the mechanisms by which we understand and reason about the world are shaped by our bodies. This implies that there is no "a priori philosophy" whatsoever. The authors explain in detail how our bodies influence our ways of thinking. A large part of this is devoted to an exploration of our use of metaphors in our reasoning. The fascinating part for me is that it sounds extremely logical, It took me a while to finish this book. It was worth every minute though. The authors explain in detail how our bodies influence our ways of thinking. A large part of this is devoted to an exploration of our use of metaphors in our reasoning. The fascinating part for me is that it sounds extremely logical, as if you illuminate the dark pathways which your thoughts take unconsciously. The book is peppered with careful deconstructions of common philosophical ideas to show their use of metaphors. The usefulness of this knowledge is pretty high. Once you see it there is no way back and you see metaphors everywhere. Not that there is anything wrong with using metaphors but it allows you to consciously judge the aptness of the metaphors used. Amazing. The stuff happening in cognitive science these days blows my mind. So, I realize that most of the reviews of Lakoff's book are positive [normally I don't look at other goodreads reviews before writing my own, because it helps to be in the dark] but I think that's reasonable, given what the book is. The book is an account to give an alternative account of what philosophy should be (Lakoff's "empirically responsible" programme) given a set of facts of the matter in cognitive science. Lakoff attempts to show that the historical tradition of western philosophy, fro So, I realize that most of the reviews of Lakoff's book are positive [normally I don't look at other goodreads reviews before writing my own, because it helps to be in the dark] but I think that's reasonable, given what the book is. The book is an account to give an alternative account of what philosophy should be (Lakoff's "empirically responsible" programme) given a set of facts of the matter in cognitive science. Lakoff attempts to show that the historical tradition of western philosophy, from Plato to Aristotle up and through Descartes and even into the 20th century, holds a number of positions which can be shown to be empirically false. That is, they entail a bunch of claims about the structure of the human mind that are just not true on the basis of the best available cognitive science. I think that is a great project, and one I have a lot of sympathy for. I think that there are definitely large portions of the western philosophical canon that are thought of as being strictly a priori that have entailments that can show them to be empirically false. But if you looked up at the stars above the review, you'll note that somewhere in here, somewhere in this project that I'd be generally sympathetic to, Lakoff lost me. There are two primary strands of complaint against any piece of writing. The first is that the ideas are simply mistaken. The second is that the text is not constructed well. I think that you can give 4+ star reviews to things that fail on the former count, or at least you should be able to; the latter is harder to forgive, and (unfortunately) that's where Lakoff goes wrong. Large sections of the text are redundant, which is fine for emphasis in a lot of situations, but it really makes this book gratuitously long and weighty, despite the sections characterizing the central ideas being relatively brief. There are times where the redundancy leads the book to feel condescending, because it uses the redundancy to illustrate rudimentary connections between ideas that are pretty obvious just from the organization of the book, or to remind readers of connections made explicitly in other sections. Perhaps the book is just written for folks who are new to philosophy, and so it comes off as often having a very low expectation of the ability of readers to stick ideas together. More problematic, though, is a sort of intellectual problem with the book. It often glosses over a huge number of claims in the philosophical canon and attempts to give very general responses. That's actually fine; given the length of the book, expanding the project by trying to go into detail would be borderline insane. However, Lakoff feeds the redundancy problem in the book by rearticulating more or less the same objections to a half dozen historically discrete philosophers. Instead of identifying traditions in philosophy that stick together on, say, the philosophy of mind, Lakoff attempts to respond to different historical epochs and winds up with something even more redundant and gratuitous. The ideas in the book are, by and large, very interesting. The notion that we could talk about logic in terms of embodiment is a cool one, though I have a feeling it would require more of a familiarity with the content of classical and contemporary logics than Lakoff has. That said, Lakoff sets up a good program for talking about these sorts of ideas. While there are definitely some points where he is overreaching, that's necessary in a book that is really trying to lay out a program for talking about philosophy in terms of cognitive science. For what it's worth, as far as illustrating a project in very general terms, I think Lakoff does a good job. This hefty volume employs the empirical findings of second generation cognitive science to challenge the Western philosophical belief in a rational disembodied mind. The primary method of critical examination utilizes the theories of "unconscious embodied conceptual metaphor" and its origins in sensorimotor experience, to explain how philosophers (old and new) have arrived at their conclusions using a metaphoric logic they mistakenly thought was literal. As you'd expect in a book written by car This hefty volume employs the empirical findings of second generation cognitive science to challenge the Western philosophical belief in a rational disembodied mind. The primary method of critical examination utilizes the theories of "unconscious embodied conceptual metaphor" and its origins in sensorimotor experience, to explain how philosophers (old and new) have arrived at their conclusions using a metaphoric logic they mistakenly thought was literal. Philosophy in the Flesh is a glowingly easy book to read. This philosophical theory of the embodied mind provides a nice theoretical framework to look at literature, culture, and science. The heft of the book is kind of intimidating but once you get into it, there's a lot of rich and detailed metaphorical fun to be had. Biggest problem: George Lakoff self-cites himself a bit too much. I expexted this to read as a text book but I was optimistic that it would be introductory level. It seems to have been written for experts in the field and so was difficult to follow in parts and failed to maintain my interest. I'm still interested in the premise of the book and may still go back and finish it. a very important book that was a mind opener for many traditional semanticists who still clung to truth-conditional semantics. Introduces cognitive semantics that deals primarily with categorization and prototypes. 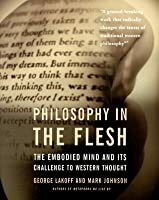 I full-heartedly agree with the review excerpt on the cover, "A ground-breaking work that radically changes the tenets of traditional western philosophy." For anyone interested in the mind, metaphorical thought, philosophy, language, psychiatry/psychoanalysis, etc. This is one of the ten most influential books in my life (and thought). I used something I learned from it in my sermon yesterday. Much of this book served to clarify and integrate what I had already been thinking about language and thinking, some of it was new and wondrous. Hugely provocative, possibly wrong in many areas, illuminating and inspirational in so many other ways. Best read together with the original book by Lakoff & Johnson 'Metaphor We Live By' and the newer work by Mark Johnson, like 'Morality for Humans: Ethical Understanding from the Perspective of Cognitive Science'. Great book on nature of language, philosophy and cognitive science. Challenges several fundamental assumptions of how we view the world and ourselves. Finally got around to reading this book and for the most part it seems reasonable. Anyone committed to a naturalist worldview would find little that was especially revolutionary. That said, however, the author's have sharp critiques of Chomsky and philosophers of the analytic tradition that I haven't the familiarity required to judge as fair or not. The authors claim that Chomsky's linguistic model (Universal Grammar) is untenable knowing what we now know about the human brain. They also suggest Finally got around to reading this book and for the most part it seems reasonable. Anyone committed to a naturalist worldview would find little that was especially revolutionary. That said, however, the author's have sharp critiques of Chomsky and philosophers of the analytic tradition that I haven't the familiarity required to judge as fair or not. The authors claim that Chomsky's linguistic model (Universal Grammar) is untenable knowing what we now know about the human brain. They also suggest that supporters of Chomsky's theory defend its validity by means of moving the intellectual goal posts when responding to critique. That is (according to Lakoff and Johnson) when a particular aspect of Chomsky's theory is refuted Chomsky et al reply that the linguistic phenomenon in question is not actually part of Universal Grammar. Again whether or not this critique holds - I do not know. Until I read this book, I was unaware just how dualistic the western mind is. The western concept of mind is similar to that of the western concept of soul. Both are disembodied and transcendent. However, the modern field of cognitive science says otherwise. We are embodied minds; our capacity for rational thought arises from neurobiology. In fact, rational thought takes place well below the level of conscious thought. Our unconscious mind is not repressed in the Freudian sense, but is inherent Until I read this book, I was unaware just how dualistic the western mind is. The western concept of mind is similar to that of the western concept of soul. Both are disembodied and transcendent. However, the modern field of cognitive science says otherwise. We are embodied minds; our capacity for rational thought arises from neurobiology. In fact, rational thought takes place well below the level of conscious thought. Our unconscious mind is not repressed in the Freudian sense, but is inherent in the neural patterns of the brain. If 98% of our thought occurs below the level of conscious thought, the remaining 2% bubbles up from the deep structure of the brain. Our conscious thoughts are not completely free, but are created by the brain, and are therefore to some extent controlled by the brain, and are limited to what the brain is prepared to comprehend. I have not finished this interesting book. It says that our thought processes are based in biology, and our most abstract and deep thoughts are built on metaphors about our bodies. There is no reason to think we have any deep understanding of reality, even in the mathematical precision of physical sciences, because we are unable to think beyond the evolutionarily limited perspectives available to a creature who has only metaphors of its own body - a historical accident and not up to finding deep I have not finished this interesting book. It says that our thought processes are based in biology, and our most abstract and deep thoughts are built on metaphors about our bodies. There is no reason to think we have any deep understanding of reality, even in the mathematical precision of physical sciences, because we are unable to think beyond the evolutionarily limited perspectives available to a creature who has only metaphors of its own body - a historical accident and not up to finding deep truths outside of concepts available via those limited origins. This book is an amazingly in depth look at what it means to be human. Current neuroscience is forcing philosophers to move away from the Cartesian concept that the mind is seperate from the body, and instead allowing us to look at what it means to be a fully embodied person. The beginning of this book looks at language, and the consistent use of metaphor that humans use to convey meaning. I am very much looking forward to reading about how the creation of the "self" is influenced by language and This book is an amazingly in depth look at what it means to be human. Current neuroscience is forcing philosophers to move away from the Cartesian concept that the mind is seperate from the body, and instead allowing us to look at what it means to be a fully embodied person. The beginning of this book looks at language, and the consistent use of metaphor that humans use to convey meaning. I am very much looking forward to reading about how the creation of the "self" is influenced by language and thought. Just briefly, the authors use finding from neuroscience to challenge some of the important findings of western philosophy. Basically, they look at how language is processed in the brain and compare that to how philosophy thinks about concepts. I should reread it and make a more serious review. I gave it only four stars because it seemed like it needed some editing, not very readable. Maybe I should give them more points for ambition. Not the slam dunk I would like to have read, but worth the trou Just briefly, the authors use finding from neuroscience to challenge some of the important findings of western philosophy. Basically, they look at how language is processed in the brain and compare that to how philosophy thinks about concepts. I should reread it and make a more serious review. One of the most transformative books I have ever read. Though a bit dry at times, it demonstrates that most of our thought is unconscious or minimally conscious, that we think in metaphors for which we have been conditioned from an early age and that we are far less in control of our choices than we think we are. This book is essential for those wishing to follow Socrates advice to know oneself. George Lakoff is Richard and Rhoda Goldman Distinguished Professor of Cognitive Science and Linguistics at UC Berkeley and is one of the founders of the field of cognitive science. He is author of The New York Times bestseller Don't Think of an Elephant!, as well as Moral Politics: How Liberals and Conservatives Think, Whose Freedom?, and many other books and articles on cognitive science and ling George Lakoff is Richard and Rhoda Goldman Distinguished Professor of Cognitive Science and Linguistics at UC Berkeley and is one of the founders of the field of cognitive science. “The mind is inherently embodied.